What’s a holiday without some sweets? St Patrick’s Day is no different, at least where this worksheet is concerned. However, for some of you who like to nix the sweets, there are a few spaces on this page that might bring you some satisfaction. 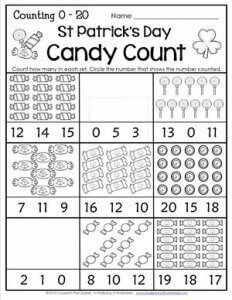 Kids count the candies in each set and circle the number that tells how many. Notice in some there are 0 candies!